The world's largest brokerage, struggling to right itself as the credit crisis continues, said it will issue more than 200 million new common shares as part of the deal. Merrill said it will write-down $5.7 billion because of additional losses on the sale of mortgage securities and hedging contracts. MER drops $10 in 3 days. You don't think someone knew something do you? Since MER sold Bloomberg LP for $4.43 billion, Bloomberg now has a youtube channel. If they were smart they would allow embedding of their videos. I was watching Bloomberg, and it turns out Bill Gross is bearish on the Euro, and he thinks the FED will hold off raising rates until the housing mess has passed. He also thinks that there will likely be 50-100 banks to fail before the housing mess is over with based on what the FDIC already said. big f%*king deal, dude that is less than 2% of the US banking system. 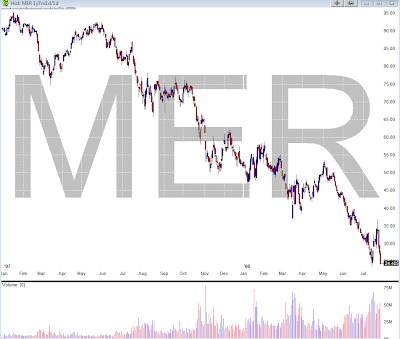 I bought some MER on the close last night , crisis creates opportunity. Most fards on THE SLOPE.... are loopsided to the dark side with their 3-4 bucks trades and this only works so often but they do not admitt that they miss completely the big monster moves to the upside over the years. Is that true that you have blown up your account already 5 times ?